My ex-Perth Qantas flight landed in Singapore on Monday night. There I linked up with the rest of our party who had flown from Melbourne, and we took the night flight to Calcutta (now Kolkata). Kolkata airport looks rather better than when I last saw it, though the baggage-eating luggage carousel seems like the same one they were using in the ’70’s. We spent our first night at the Hotel Host International (otherwise known as the Hotel Smelly Carpet) which is just a few kilometres from the airport. After snatching a few hours sleep, we assembled for this group photo at sunrise before heading North for the 130km journey to Mayapur, District Nadia. We caught a light breakfast of Dob (fresh coconut juice) as we approached the final stretch. Our vendor expertly lops the head off the immature coconuts with his very sharp sickle (smaller than a machete). Careful with that axe, Eugene! A few more slashes and the inner sanctum of the life-giving fruit is ready to puncture with the very tip of the blade, reaching the cool sweet juice. In goes a straw and there you have it – a litre of instant, ever-so slightly salty-sweet refreshment. After you drink the juice, the vendor will slash you off a piece of sharp coconut rind to scoop out the sweet, slippery inner immature coconut flesh, rounding out the wonderful, primeval coconut experience. The roads were very quiet due to threats of a State-wide strike, so we sailed in to the campus of Mayapur Chandrodaya Mandir at around 9.00 am. The ancient town of Mayapur sits directly on the Tropic of Cancer. The Chandrodaya Mandir campus, world headquarters of the Hare Krishna Movement, has changed so much in the seven years since I was last here. So much new construction! Pictured here: the original building on the left is the Lotus Building, and to the right the Conch Building, both used mainly for accomodation. There’s a contingent of 78 buses arriving at the end of this week, carrying over 3000 devotees from Mumbai. I’ll enjoy the relative quiet until then. It is hard to do justice to the wonderful atmosphere and sheer enormity of the place by photo. But I’ll attempt to give you a taste over the next week, and share my spiritual adventures with you to the best of my abilities. Stay tuned! This morning I fly to Singapore to join a party of friends en route to The Subcontinent for a long-awaited pilgrimage to India’s Holy Places. First stop Kolkata, West Bengal. My destination: Sri Mayapur Chandrodaya Mandir, district Nadia. Mayapur is the birthplace of Sri Chaitanya Mahaprabhu, pictured below. I’ll try to share my visit with you in the form of photo essays. As promised: some vision from my final class of this cookery tour, in Victoria’s High Country. Here’s the news, outside the Mansfield General Store. ‘Under the influence of what?’, you may ask. Well, in this case it’s ‘under the influence of Kurma’. Ash is ready to enjoy the fruits of our evening labour. Our evening repast certainly does look appetizing, yes? ‘Romantic’ lighting made it a challenge to capture the photo opportunities, but here we are, seated at Mansfield’s longest vego banquet table ever. And that winds it up for travelling and cooking interstate until next year. I hope to see you in a kitchen somewhere, sometime! Today I head to Victoria’s high country for my final class of this tour. The country town of Mansfield is a scenic two-hours from Melbourne. Mansfield is a major trail riding centre, a result of its long tradition with horses, dating back to when they were used by cattlemen driving their herds up to the high mountain pastures. It’s close to one of Australia’s premiere skiing resorts. Yes, all you oversees readers, it does snow in Australia. The Mansfield General Store is the venue for tonight’s hands-on cookery extravaganza. Then I’m heading back to Perth in time to repack for my Ultimate High of the year, my visit to India’s Holy Places. My reply: Here it is! Our test kitchen crew couldn’t believe it when I disclosed to them that these muffins were completely dairy-free and almost totally fat-free. They are also egg-free, but certainly not taste-free, and their texture has to be experienced to be believed. Makes 12 muffins. Combine the dates, maple syrup or honey, bicarbonate of soda and 1 cup water in a saucepan, bring to the boil and simmer over low heat for 2 minutes. Cool to room temperature. Fold together the remaining ingredients, and stir in the date mixture. Mix well and spoon into 12 non-stick muffin tins. Bake for 25- 30 minutes, or until the muffins are golden and fully cooked. Serve the muffins warm or at room temperature with the cottage cheese, honey and cinnamon. I’m in Melbourne, catching up on some rest; travelling and teaching is tiring. Saturday’s cooking event at Cooking Co-ordinates in Australia’s National Capital, Canberra went exceptionally well, and we really ‘packed ’em in”. We had 41 attendees. This photo is deceptive – they’re not all in this shot; some were seated on the side of my cookery arena. I was amazed to discover that over a third of them came because of reading an article published in the Canberra Times the week before. “As a young journalist with a Melbourne newspaper, I took one of the city’s notoriously picky food critics to Gopal’s. We were catching a tram downtown for lunch, and he was shocked to hear my destination was, as he sniffily put it, “the Hare Krishna canteen”. Was I so broke I couldn’t afford a nice camembert and salad bagel in an upmarket sandwich bar? He offered to shout me lunch, obviously out of pity that my options had sunk so low, and I dared him to put his prejudices on hold and join me. Aw gee shucks … it makes me go all warm and tingly. 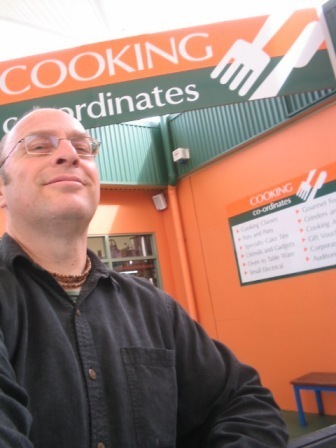 Today I fly to Canberra, the National Capital, and get set up for my very-full class tomorrow morning at the Cooking Co-ordinates cookery school at Belconnen Markets. I have a record attendance, so it should be a busy two days ahead. Let’s get co-ordinated! This morning I received a request for a pumpkin pie recipe. Here’s mine, from my second cookbook ‘Cooking with Kurma’. It’s a beauty, and tastes as good as it looks. This is a spicy, all-American favourite dessert. Select highly flavoured, dark-fleshed pumpkins for optimum flavour. For Australian readers, butternut, or especially Jap pumpkin, is highly recommended. 1. Combine the flour, butter and salt in a food processor and process with 12-15 short bursts until it resembles coarse breadcrumbs. Sprinkle in 2 tablespoons cold water, and process with another 6 short bursts. Add another 1 or 2 tablespoons water, if required, to form a damp mass. 2. Remove and gather the pastry into a ball, and place it on a floured surface. Roll out the pastry to line a 22.5cm (9-inch) pie dish or tart pan with removable bottom. Trim and crimp the edges and chill while you prepare the filling. 1. Split the pumpkin crosswise. Remove and discard the seeds and fibres. Place the pumpkin, cut side down on a lightly buttered baking sheet. Place in a 160 C/320 F oven and bake for about 1 hour, or until the pumpkin is tender when pierced with a knife. 2. Scrape away the pulp from the skin, discard the skin, and place the pulp in a food processor fitted with a metal blade. Process in batches until smooth. 3. Force the pumpkin purée through a sieve, measure 2 cups for the pie and reserve the remainder for other purposes. Combine the measured pumpkin purée with all the other filling ingredients. Beat with a wire whisk until smooth and creamy. Pre-heat the oven to 200 C/390 F. Pour the filling into the chilled pastry case and smooth it out. It should be barely 2.5cm (1-inch) deep. Bake for 40 minutes or until the filling is set. Cool, cut into wedges and serve with whipped cream. Our class the other night at Foodstuff in Mona Vale was lots of fun. I planned a very generous menu, and the staff, especially Mark, the proprietor and my assistant for the night, were worked to a frenzy. The food we cooked was delicious, the attendees were brimming with enthusiasm, and they laughed at my jokes. To top it off, the guests went home a little wiser, very jolly and pleasantly plumped. Who could ask for anything more? No dusty trails for me today, but “I’m off to Mona Vale” (yes you can sing the “Caissons” song if you’re American, feeling patriotic, and know the words). I’m catching two buses and one train to visit ‘Foodstuff’, a Gourmet Food/Cookery School in Mona Vale, a suburb of Sydney’s Northern Beaches.